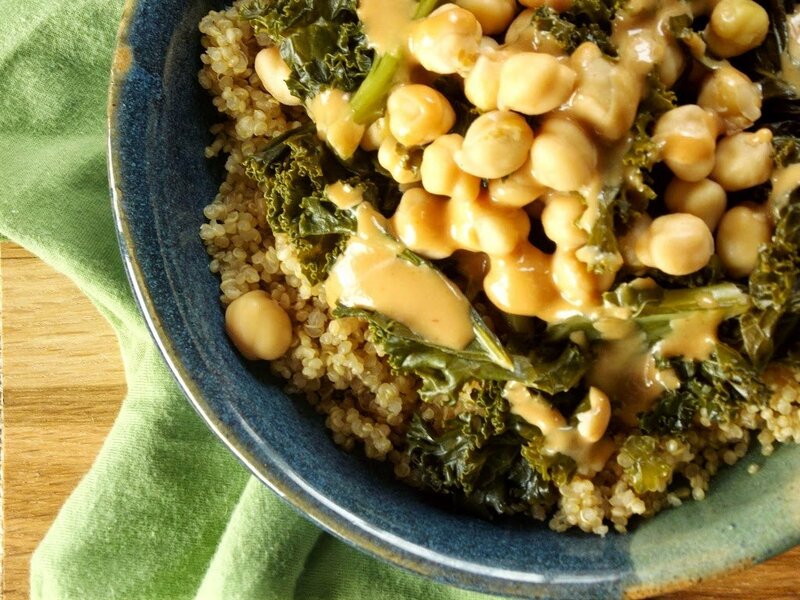 Tender galicky kale and chickpeas are served over quinoa and topped with tangy tahini sriracha dressing to make this simple but flavorful vegan meal. Every so often I throw something together for dinner, not intending for it to end up on this blog, only to have it turn out so delicious that I decide I have to share it. This was one of those things. Lucky for me, we’re getting a lot of daylight this time of year, so last minute dinner photo shoots aren’t a big problem. This actually couldn’t have happened at a better time. I was getting a little behind on my posting schedule a few weeks ago, mostly due to unexpected computer problems that not only took away my publishing tool, but ate up a lot of my time. I had a bag of kale in the fridge, and the rest of the ingredients are staples in my kitchen. Nice to know that at any point in time I’m just a pound of kale away from an awesome dinner. This dinner came together on the day my new computer came into my life, so it felt kind of special. After all my stress and worry I got a new computer, a delicious and easy meal, and a bonus blog post. I’ll have to check to see if mercury exited retrograde or something on that day. Now, the secret ingredient to this is the sauce. I have a friend and former co-worker to thank for that part of the recipe. When we worked out of the same office last year, she instructed me one day to borrow some of her tahini dressing at lunch time. It was amazing, and though I can’t remember the exact ingredients list, it’s safe to say it resembled this one. This version turned out a little unexpectedly though. I don’t know if it was the sriracha, or just the entire combo of ingredients here, but, well, it tasted like cheese sauce. That was my first reaction. That was also my boyfriend’s first reaction. It was good to get confirmation that I wasn’t crazy. In any event, whether you find it cheesy or not, this sauce is delicious and will probably go over all kinds of food that goes into my mouth from now on. 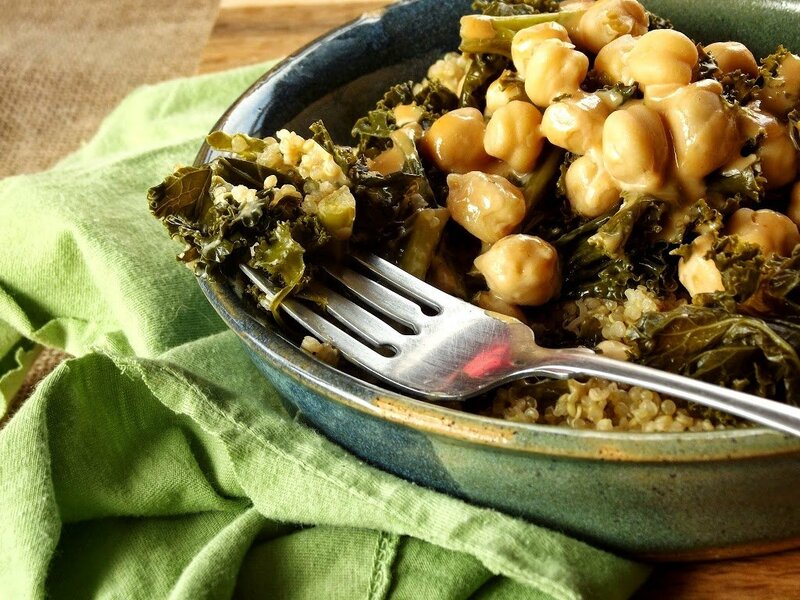 It goes perfect with the kale, and I highly recommend incorporating the two ingredients into whatever meal your creativity leads you to. Last night I put everything in a wrap with tofu, skipping the quinoa. 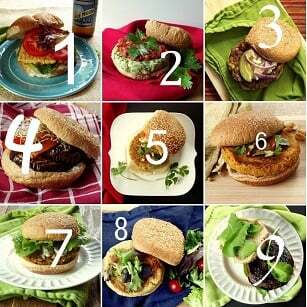 Try this recipe. Try a clever variation, and when you do, be sure to let me know how it turns out. Heat 1 1/2 cups vegetable broth in medium saucepan. Bring to a boil. Lower heat to a simmer and stir in quinoa. Cover and allow to simmer for 15-20 minutes, or until all broth is absorbed. Remove from heat and allow to sit for at least five minutes, covered. 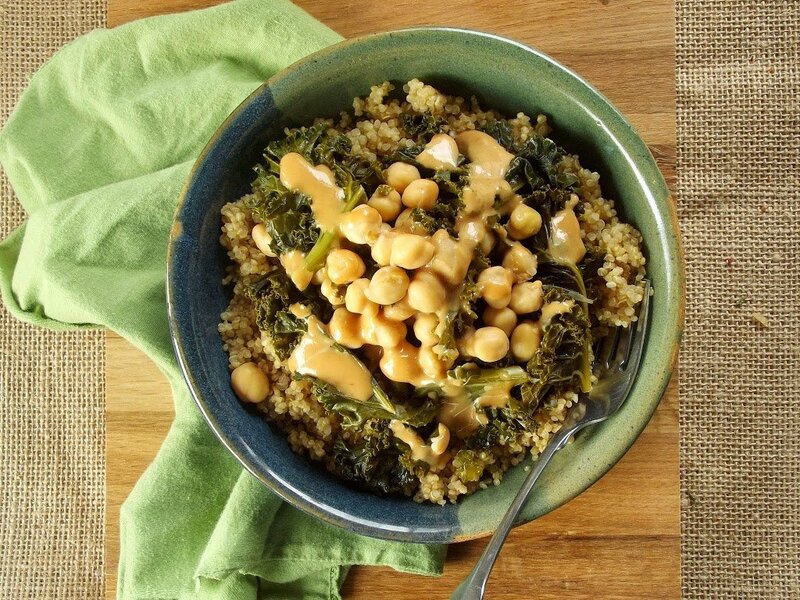 While your quinoa cooks, prepare kale and chickpeas. Heat olive oil in large saucepan or stock pot over medium heat. Add garlic and sautee for one minute. Add kale, remaining 1/2 cup broth, vinegar, salt and pepper. Toss to coat kale. Cover and allow to cook until tender, about 5-10 minutes, tossing every so often to prevent the bottom layer from burning. Add chickpeas, mix well, cover and allow to cook for another minute or two, just to get the chickpeas hot. 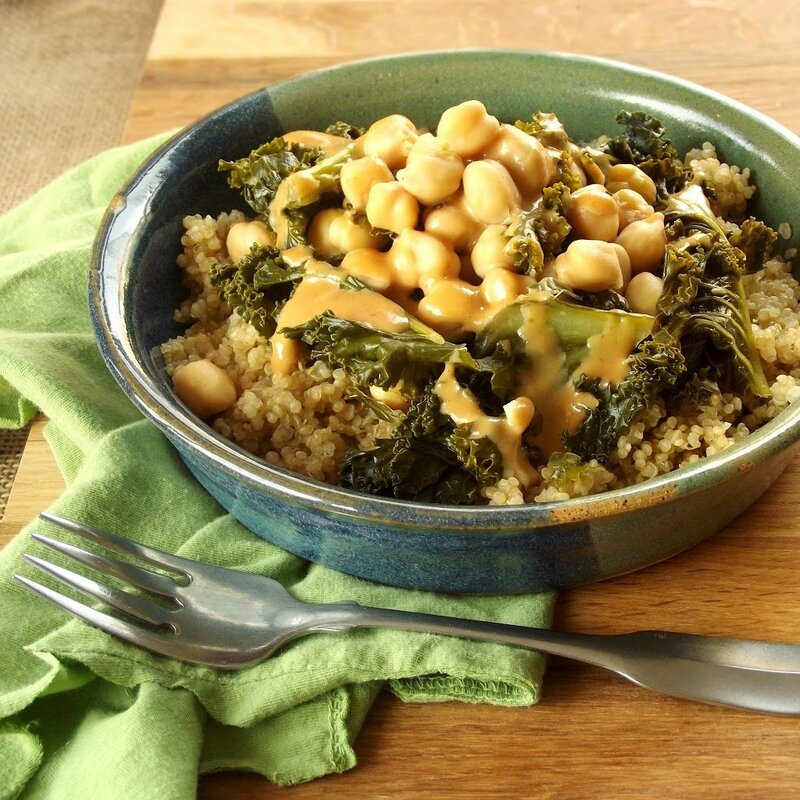 Divide cooked quinoa into bowls, and top with kale mixture, then with dressing.